Tuesday, August 7, 2018. On that day, I went to SLS earlier because there was a flag ceremony at 7.30 a.m. Yeah a flag ceremony! In the college, the flag ceremony always hold on every Monday, but there was a difference with the flag ceremony in SLS, it was always hold on Monday-Friday. In Indonesia, for elementary and high school held the flag ceremony every Monday but for college just when there was national day. This was my second time that I heard Philippines National Anthem. Yeay, then the SLS students sang two other songs, the title of the song maybe BSU Hymn and La Trinidad Hymn. Very interesting. After the ceremony, we introduced our selves in front of all students and teachers. This school was using ‘K to 12’ basic education curriculum. The ‘K to 12’ Program covered Kindergarten and 12 years of basic education (six years of Primary Education, four years of Junior High School, and two years of Senior High School) to provide sufficient time for mastery of concepts and skills, develop lifelong learners, and prepare graduates for tertiary education, middle level skills development, employment and entrepreneurship. Then, I met with Ma’am Rose in her office. We discussed about our project to finish the Sea Teacher Project. She gave a copy of her schedule to me. Based on that schedule, we had four classes every day. Ma’am Rose taught in five classes, they were 9-2, 9-3, 8-2, 8-1, and 8-3. She also gave two modules (grade 8 and 9) and green map which contain the copy of ‘K to 12’ basic education for Grade 8 and Grade 9. For that day (Tuesday, August 7), I would observe Ma’am Rose in four classes, those were 9-2, 8-2, 8-1, and 8-3. Ma’am Rose asked me about my pray time and she allowed me to pray first in the last class time. That was a religious tolerance. In SLS, the duration of one section was one hour and there were four math lesson times on everyweek. It was different with time allocation in Indonesia, especially in Central Java (my province). The time allocation was 40 minutes for Junior High School and 45 minutes for Senior High School. 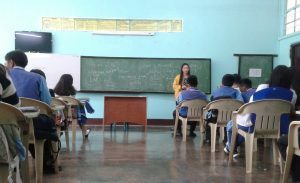 Usually, the duration for math lesson was 2-3 teaching times on one section (80-135 minutes on one section) and the students had math lesson for twice a week. I was calling Kilayon while I waited my first observe time in grade 9-2. I asked her to bring an example of lesson plan which was used by the teacher of SLS. She came with a pink book on her hand. It was her mother’s lesson plans collections. Her mother was a teacher of Elementary School. We shared about our language each other. I learned Tagalog and he learned Bahasa (Indonesian Language). I continued with my observe time. First class was grade 9-2. It was first meeting for grade 9-2 in this semester. There were 47 students of grade 9-2. Ma’am Rose greeted the students with some questions about their condition and holiday, then she wrote a question in the board, it was “Why are we here?”. Some students answered “ For learn”. But, Ma’am Rose’s answer was “Because we are citizen of the world”. Then, Ma’am Rose gave some questions about social and life. She taught about the values education. For example about technological development that impacted to us, lifestyle, house rules, discrimination, cheating, bullying, relationships, love, ect. Ma’am Rose discussed with students about those issues. The one of important things was about rules. There were many rules in house, school, and social, also in Math. All of things or problems were coming back to the rules itself. Without the rules, we would have troubles when learn mathematics. So in math, rules were very helpful. We also needed rules for rights. Students were very active on that discussion. Basically, Ma’am Rose had values education background. Ma’am Rose introduced her self. The student could call Ma’am Rose by “Ma’am Reos”. After the class finished, I asked about something on my observation. 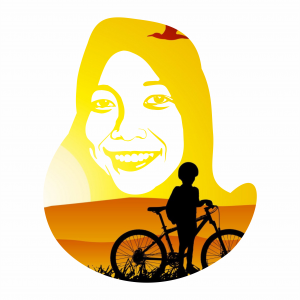 She told that besides teaching mathematics, we had to teach about values education to students. She gave simple discussion and motivation for student because mostly students had problems on math lesson. Mathematics learning was difficult for them. 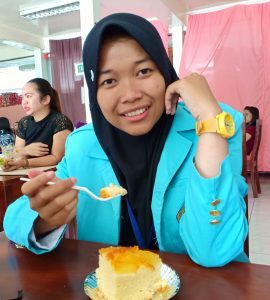 When lunch break time, Andyta, Rina, Putri, Argee, Doly, and me went to BSU Marketing. I bought a piece of cake with pineapple as the topping. Very delicious! Next observation was in grade 8-2. There were 45 students of grade 8-2.That was the second meeting for them. First, students was asked to clean the class and submit their assignment. Ma’am Rose spreaded the module from Singapore source. She checked students attendance and gave activity. Students counted the sum of the seatmate’s moles. The topic of that day was “algebraic expression” or “polynomials”. 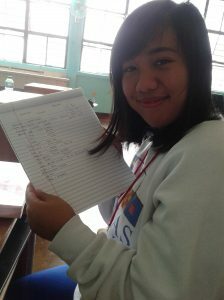 Ma’am Rose gave the comparation of algebra in kindergarten, elementary school, and high school. She also gave the definition of variable and constant. Then, students were given quizzes about polynomials. They had to distinguish between polynomial or not polynomial. Meanwhile, Ma’am Rose was monitoring her students on solving that problems. Their answers were checked by their seatmate. They looked very happy when they had the correct answer and looked sad when they got the wrong answer. Ma’am Rose gave an assignment for them. Class finished. I and Ma’am Rose went back to our own room. Next observation was in grade 8-1. There were 37 students of grade 8-1. Learning activities included: checked attendance, review the previous material, motivation, students activity, checked students’s answers, and generalization. the topic was the same with grade 8-2. The different thing was some students were being volunteers to answers the problem. 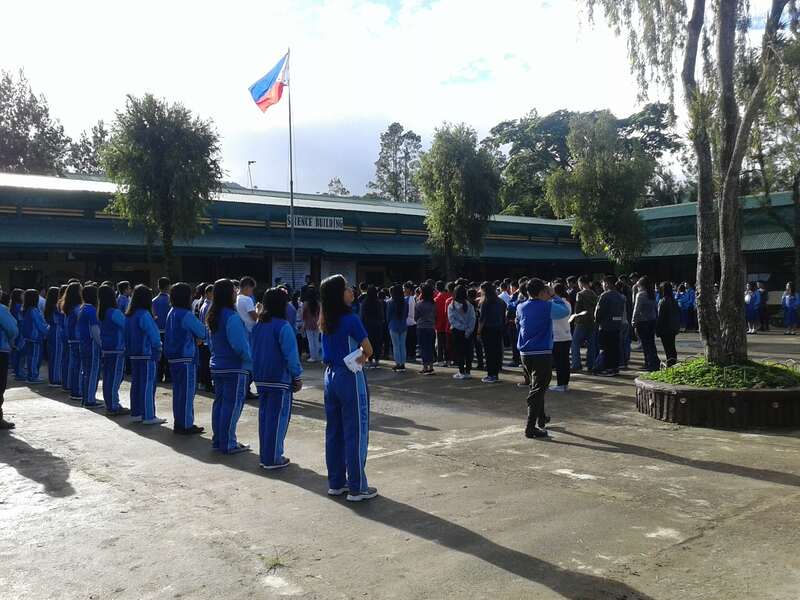 The students of grade 8-1 were more active than the previous classes. Ma’am Rose told that mostly students of grade 8-1 had easy to learn mathematics. That was my brief story when i was observating. 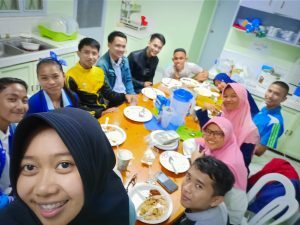 At my night, I and other student teachers from Indonesia were cooking for our dinner. That night was difference, because some buddies and one SLS student joined with our dinner. They tried to taste “Bon Cabe” and our foods. Incidentally, our food was little more spicy than usually. They told that our foods very spicy.